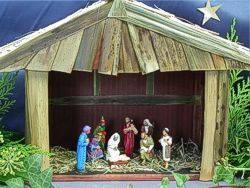 Welcome to the Prince August Tutorial on making a Nativity set. This month we concentrate on assembling a free stables that will allow you to display your figures perfectly. If you followed last months tutorial on casting you should have all the Nativity figures cast already. Well now we build the stables to put them in. The basic materials are all easy enough to find and should be free. You do need a stapler, wood glue and some broad tape to hold everything together. These blueprints have all the measurements needed to make the stable. Please click on both to open a A4 printable version (larger version 300dpi). Follow the measurements exactly and then follow the guide below. Save the images to your hard drive first by right clicking on the image and choose 'save picture as' (Microsoft I.E.6. version, other browsers may differ). The basic material is cardboard. 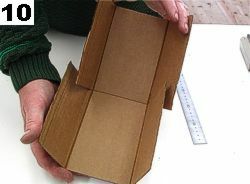 Use strong stiff cardboard from a computer packing box for example. Open it out and using the blueprints we supply mark out the basic shape. Cut off the excess and cut the small flaps as shown in the diagram. Use a metal ruler and fold AGAINST the grain for the main body folds. This will make the folds much sharper and cleaner. Then fold the side flaps using the ruler as well. 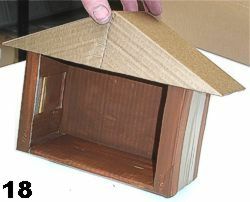 Fold up the cardboard as shown in the diagram and use a little tape to hold it together. Next fold the end flaps as shown in 4 & 5. Firmly tape using a wide packing tape the ends. Finally fold the two center flaps into the box and staple them securely to the roof and floor of the stables. Select a new stiff piece of cardboard for the roof and use the blueprints we supply to get the measurements correct. Cut off the excess and cut the sides to form flaps. Use a metal ruler to fold AGAINST the grain again for the middle fold. Fold the flaps as sharply as possible (with the grain). 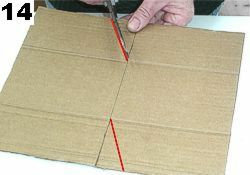 Bend the cardboard into an angle with the flaps overlapping as in the diagram. Position the roof on the main body of the stables and decide on how steep the angle of the roof will be. The mark with a pencil the center point of the overlap as shown. Open the roof again and draw a triangle using the marks you had made. Remember that the opposite side should also have the angles marked. Now cut the excess triangles away. Refold the roof as shown and staple the flaps together securely. Lay on a flat surface and using a ruler draw a horizontal line across each side as shown to mark off the unwanted side cardboard. Cut the excess off, Now the roof is completed. Add to the stable. Use glue if desired. With a sponge, apply brown paint to the cardboard stable. Woodgrain acrylic paint is suitable (Vallejo 828), but any brown (or similar colour of your choice) will do. Apply as best you can using glue, staple gun, etc. Since the roof overhangs the stable body, you can use a staple gun quite easily to quickly attach materials. I used dried sword-like leaves of a huge giant grass (see picture below) from a garden to make the decoration for the walls and front of the roof. Glue straw on the sides of the roof to create a thatch effect. Trim excess off with scissors. Cut up hay or dried grass clipping to spread on the floor. It took about 2 hours to decorate.